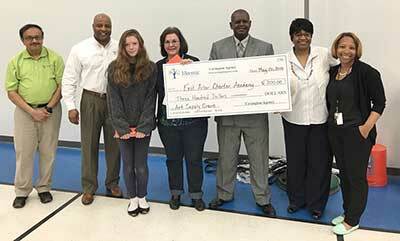 Denese Brown and Daryhl Covington delivered Meemic Foundation grants and awards to several schools around Ypsilanti. Brittany Semrow of Erickson Elementary will work on a program that integrates math and English into physical education classes. Joel Grambau of Estabrook Learning Community will have his class study the digestive system in a new, hands-on way. Michelle Mazareanu of East Arbor Charter Academy is one of our Meemic Masterpieces winners. She’ll receive a Kindle Fire while her sponsor, Pat Johnson, will receive a grant for art supplies for the school.